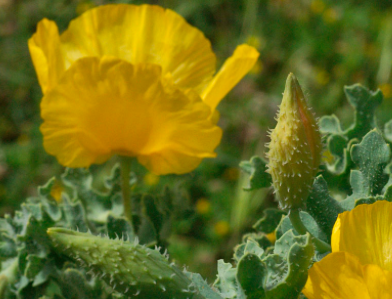 Yellow Horned Poppy is a Xera favorite perennial. This true poppy bears a long season of large irredesant light yellow flowers. They appear in succession for 6-8 weeks into the middle of summer. Flowers are replaced by long “horns” which are the seed pods. Incredibly blue glabrous rubbery foliage is wonderful with the glowing flowers. Full sun, well drained poor to average soil- adapts to rich soil with less water. Light summer water though established plants get by with nothing. To 2′ x 2′ in a single season. Dies back to a low rosette of leaves in winter. Will often seed around and you want this to happen cause the more of these the better. Average lifespan: 3-5 years. moderately deer resistant. No other pests. Excels in gravel gardens. We are a local retail nursery only (no shipping, no online sales).